Chicken Feathers is farther from the crowds but close to all the fun! If you are looking for more room for your family to play but want to be able to hop on the shuttle to the slopes and be SUPER close to the Timber Creak Ski School than this is your abode. This duplex got it's name because the outside of the home has wood shingle siding that look like actual chicken feathers. What makes this home so special are a few things. First, the living room and kitchen is super open, perfect for entertaining the whole family on your ski trip. The living room has a very large sectional sofa perfect for games and card playing. There are windows all along this space that give way to gorgeous meadow and mountain views so you can experience the real Kirkwood. Because the living room is on the second story, it means you are more likely to experience these views without them being blocked by snow mounds that can often accumulate on the first story up here. There is no TV in this home, but there is WIFI so bring your iPads and Tablets! There are a few board games but bring your family favorites! Another special feature of this home is the detailed tile work in the bathrooms and kitchen that give this home a unique look. The kitchen is fully stocked for all of your cooking and entertaining needs. Two bedrooms are downstairs and one bedroom is upstairs. One of the bedrooms even has a king sized bed which is very rare in Kirkwood. There is also a large entry way to store your skis and boots. There is parking for 2 cars across the street from this home and plenty of snow play areas for the kids. You can take a very short shuttle ride to the main lifts or put on your cross country skis and walk out to the miles of groomed Nordic trails. This duplex has something for everyone and is sure to please! - 3rd Guest Bedroom - Queen and single bed. We provide the following amenities: dining table seating for 6, bar seating for 4, dishwasher, gas stove, microwave, coffee maker, basic pots and pans, dishes and silverware. Wifi and games only (no tv). 2 outdoor surface parking spaces. 34165 YarrowPlace, Kirkwood, CA. 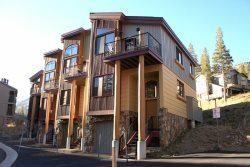 Video produced by Tahoe Real Estate Photography for Pyramid Peak Properties from Tahoe Real Estate Photography on Vimeo. Kim and Kelly are all great! They are always very courteous and get back on each query. Beautiful, beautiful, beautiful! We loved this property and amazing views. We would like to stay here every visit if possible. Loved the coffee machine, ended up buying the same coffee machine for my husbands birthday as he had fallen in love with it. Everyone on your team was so easy to work with, especially Nicole and Joan. The duplex was bright, airy and so well stocked!. I would rent this property again.